Loop calibrators are a type of electrical calibrator specifically designed to troubleshoot 4-20 mA current loops. 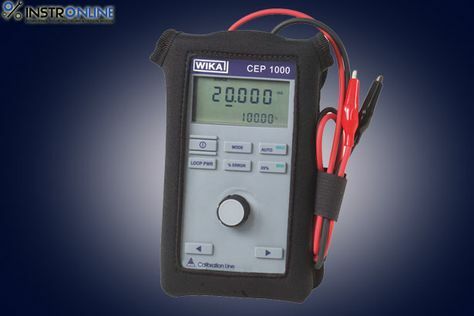 These versatile instruments are capable of measuring current, sourcing current to unpowered devices in a loop, as well as simulating the operation of loop-powered 4-20 mA transmitters. An analog current loop is an electrical signaling scheme that uses a current source and a current receiver. Current loops are extremely common in industrial measurement and control applications due to their ease in setting up, wide power supply requirements, low noise output, and ability to be transmitted over great distance without loss—even if there is significant electrical resistance in the line. With current loops, the sensor draws current from its power source in direct proportion to the mechanical property it measures. For example, a 0 to 100 psi pressure sensor with a 4-20 mA current loop draws 4 milliamps from its power supply at 0 psi and 20 milliamps at 100 psi. The relationship between current value and the corresponding process measurement value is determined by calibration by which measurement values are assigned ranges within the span of 4-20 mA. A primary benefit of the current loop is its simple wiring. Generally, a current loop consists of a power supply, a transducer and one or more pieces of instrumentation all connected together in a ring with the supply voltage and measuring current supplied over the same two wires. Current loops are used to measure pressure, temperature, flow, pH, or other process variable. A current loop can also be used to control a valve positioner or other output actuator. Depending on the source of current for the loop, devices may be classified as active or passive. Some instruments have an active output which includes both the control of the current in the loop as well as provide the supply voltage. Passive loops, on the other hand, require an external power supply. Calibration is a comparison between two devices. The first device is the unit to be calibrated, often called the unit under test. The second device is the calibrator, which has been fixed to a standard of a known accuracy. The exact calibration procedure depends on the type of instrument being calibrated. For displays and controllers, the calibrator generally sources or simulates a signal which is read by the unit under test. As the signal sent by the calibrator is of a known accuracy, any discrepancy is the error of the unit under test. The unit under test can then be adjusted until it displays the correct value. For sensors and transmitters, the calibrator generally reads the signal sent from them while they are under test conditions, such as a pH sensor being immersed in a calibration solution of a known value. With the test conditions being exactly known, any discrepancy between those conditions and the measured value is the error of the unit under test. Adjustments can then be made to account for that error. Typically, calibration of an instrument is checked at several points throughout the calibration range of the instrument. Not all standards are created equally. While all standards have a known accuracy, there are some—known as primary standards— that are the highest level of accuracy for a specific parameter. Primary standards achieve their high accuracy by relying upon measurement technologies using fundamental physical constants that do not drift. For example, the value of the volt is defined by the Josephson Effect which has an accuracy of 1 part per billion. These fixed values minimize uncertainty, making primary standards the most accurate calibration tools. Industrial standards, also known as field standards ideally have an accuracy 4 times greater than the instrument being calibrated. These are useful for spot checking sensors at the point of use rather than a laboratory environment. Secondary standards, also known as laboratory standards provide greater accuracy than field standards and are used to calibrate field standards. Primary standards, provide the highest calibration accuracy. Primary standards are used to calibrate secondary standards. To improve the quality of a calibration to levels acceptable to outside organizations, it is generally desirable for the calibration and subsequent measurements to be traceable to internationally recognized standards. Establishing traceability is accomplished by a formal comparison to a standard which is directly or indirectly related to national standards (such as NIST in the USA), international standards, or certified reference materials. What type of signal is used by the equipment to calibrate? What measurement parameters do the units to be calibrated have? Where will calibrations take place? The lab? The field? Are any communication protocols needed? What types of adapters are needed to attach the unit to be calibrated to the calibrator? Is a calibration certificate is needed? Which one?